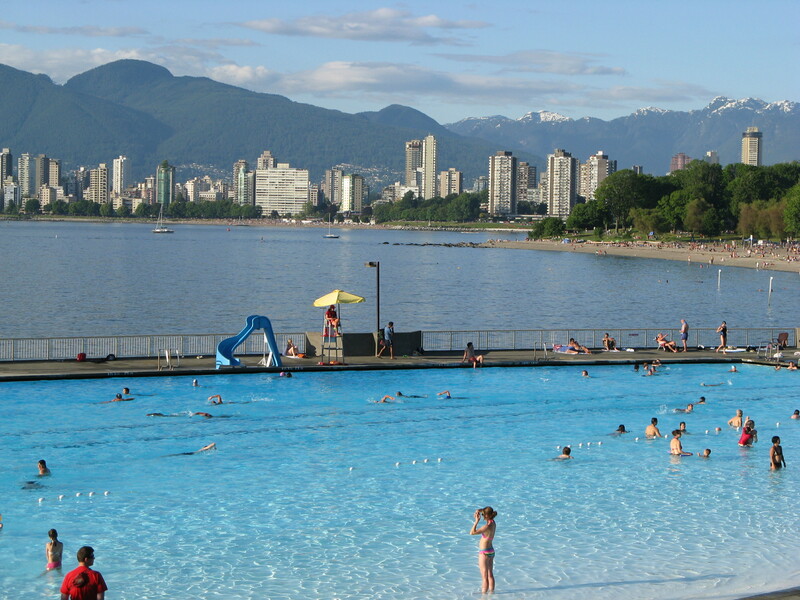 Vancouver is one of Canada’s favourite cities, and not just because of the weather. And it is a city that takes its food, especially seafood, seriously. Thankfully, the city (and its citizens) doesn’t take itself too seriously. Where to eat the best brunch in Vancouver. The 22 best restaurants in Vancouver. The 20 best things to do in Vancouver. Blue Water Cafe and Raw Bar. 1095 Hamilton. Exceptional service and quality. Seafood, obviously, and a stunning wine collection. Part of the Top Table Group. Maenam. 1938 West 4th Ave. Great Thai food. Fantastic cocktails. And the street food, especially Fresh Local Wild and Tacofino Cantina. Kingyo. 871 Denman (West End near Stanley Park). An authentic Japanese tavern. Fantastic sushi and ever-changing specials. Fresh squeezed (in front of you) ruby red grapefruit juice, with or without vodka. Homemade sodas. Loud – staff w ill shout out greetings and farewells in Japanese. Bin 941. Davie near Burrard (West End). A miniature, groovier, less formal version of Ottawa’s Play Food & Wine. A tiny and friendly restaurant. Patrons at tables next to you will offer you a bite of what they’re having to help you choose from the menu. Market by Jean-Georges in the Shangri La Hotel. 50-minute $29 lunch. $65 6 course set menu. Lobby bar also good. Rec: crab dumplings in meyer lemon, sirloin, banana caramel cake. Best app: rice cracker tuna. Drinks: fresh ginger ale, ginger margarita. Apps 9-14, mains 22-28. (Chi Spa also nice, and you can use the outdoor pool after your treatment). 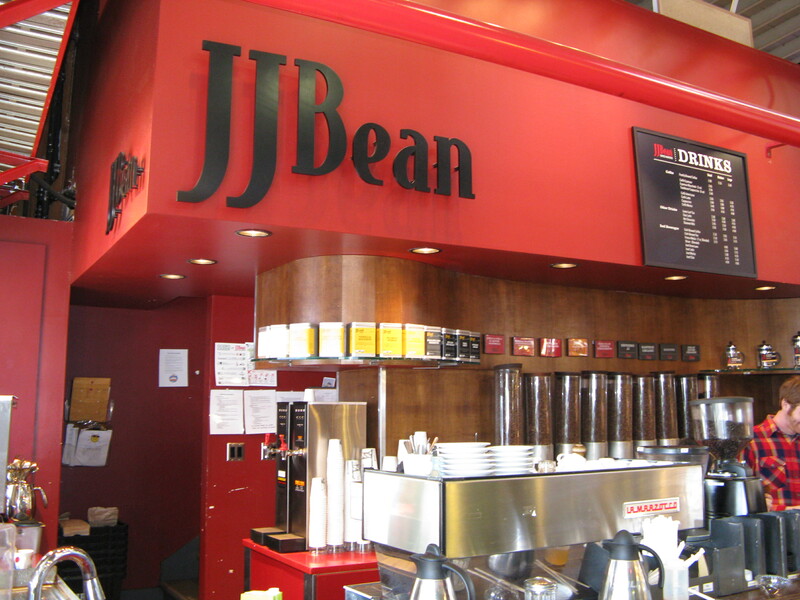 JJ Bean. Davie and Homer, Granville Island, and other locations. Local coffee. So smooth even I can drink the lattes unsweetened. Try their signature “competition espresso”. And take some whole beans home for your good friends. Go Fish. 1505 W First Ave (just W of Granville Island on Fisherman’s Wharf, walk W along water). 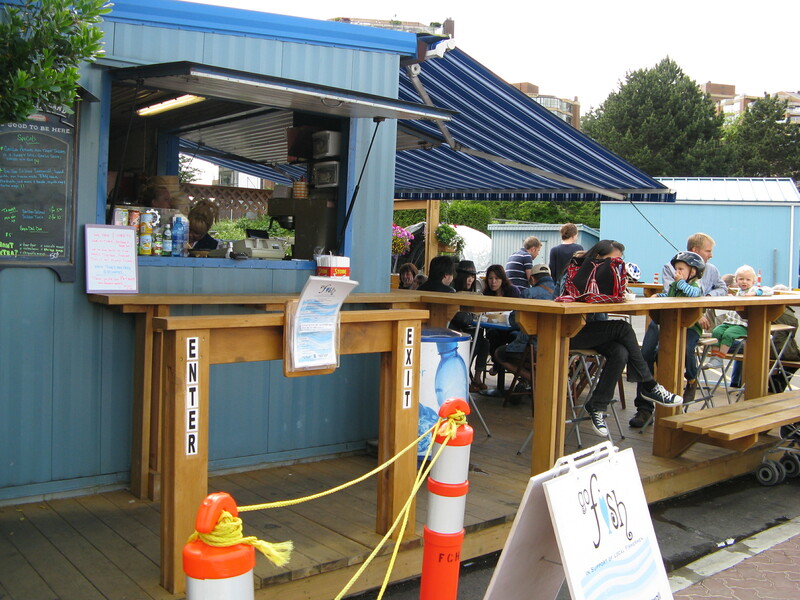 An outdoor shack, with very minimal seating, which has Vancouver’s best fish and chips, po boys, scallop sandwich, fish tacones and more. 1130am – 630pm or til sellout. Closed Mondays. Lineups at peak hours. The West End is the neighbourhood nearest to Stanley Park (and you’d really miss out if you didn’t take a walk or bike ride through the park). Kingyo. 871 Denman (West End near Stanley Park). An authentic Japanese tavern. Fantastic sushi and ever-changing specials. Fresh squeezed (in front of you) ruby red grapefruit juice, with or without vodka. Homemade sodas. Loud – staff will shout out greetings and farewells in Japanese to new arrivals. 5:30-12. Espana. 1118 Denman. Spanish tapas and deliciousness. 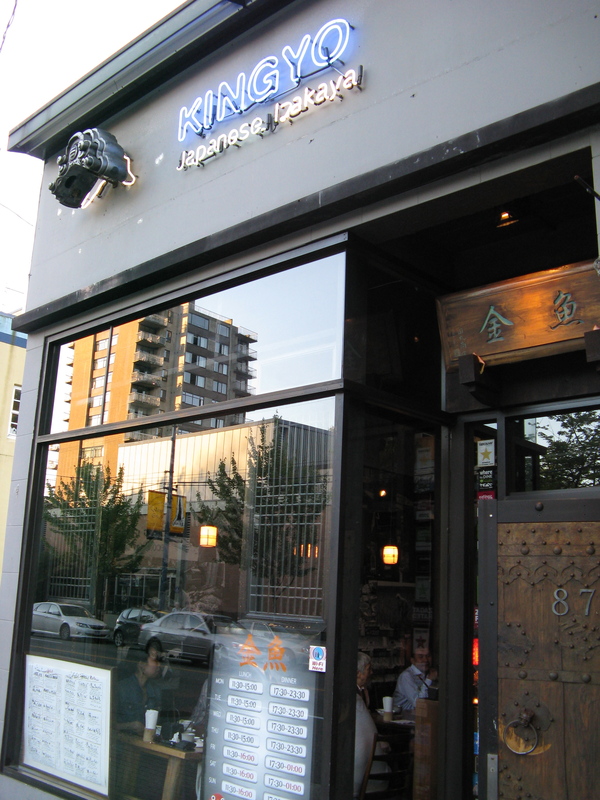 The West End’s Korean restaurants: some of the best Korean in Vancouver! Kintaro Ramen. 788 Denman. The first speciality ramen shop in Van. Lineups out the door, and for good reason. Closed Mondays. Cash or debit card only. Motomachi Shokudo. 740 Denman. Ramen resto, sister to Kintaro. Signature dish is Bamboo-Charcoal Dark Miso Ramen. Ramen Santouka. 1690 Robson between Denman and Cardero. Specialize in traditional northern Japanese style of ramen. Ramen lovers love their Toroniku Shio Ramen. Zabu Chicken. 1635 Robson west of Cardero. Korean-style baskets of friend chicken and Korean beer. Damso Modern Korean Cafe. 867 Denman near Haro. Bulgogi burger and yam fries. Westender Korean Restaurant. 854 Denman near Haro. Korean BBQ, serving only grilled pork belly (and kimchi and lettuce to wrap your pork belly). SURA Korean Royal Cuisine. 1518 Robson. For traditional samgyetang ginseng soup. Ma Dang Goul. 847 Denman. Excels at Korean stews and soups. Small, rustic neighbourhood place. Nook. 781 Denman. Real Sicilian pizza. Banana Leaf. 1096 Denman and other locations. Malaysian. Mondo Gelato. 1094 Denman. 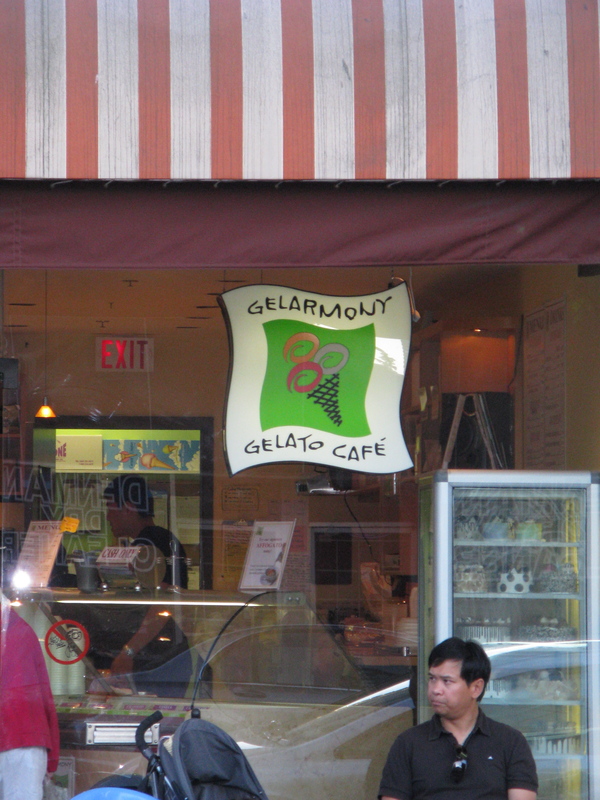 Excellent gelato in traditional flavours and non (e.g. fior di latte). Bin 941. Davie near Burrard. A miniature, groovier, less formal version of Ottawa’s Play. A tiny and friendly restaurant. Patrons at tables next to you will offer you a bite of what they’re having to help you choose from the menu. Cardero’s. 1583 Coal Harbour Quay. (604) 669-7666. Waterfront view of Coal Harbour. Forage. 1300 Robson in Listel Hotel. Breakfast, weekend brunch and dinner. Very local and sustainable. 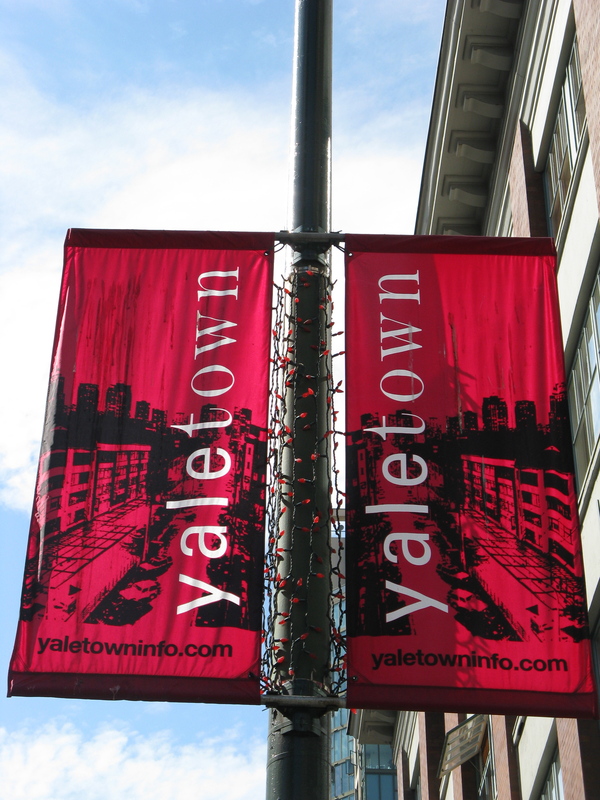 Yaletown has a good mix of bars and restos, and is especially popular at night. Some good shopping. Blue Water Cafe and Raw Bar. 1095 Hamilton. Exceptional service and quality. Seafood, obviously, and a stunning wine collection. One of my favourites. Part of the Top Table Group. Simply Thai. 1211 Hamilton. Another fantastic Thai place. $10 lunch too. Provence Marinaside Seafood Restaurant Bar & Grill. 1177 Marinaside Cres. Good seafood. Sciue. 126 Davie at Roundhouse (also downtown). Roman style pizza. Yaletown Brew Pub. Mainland St, across from Goldfish. Great. Brix. 1138 Homer St. Pacific NW seasonal cuisine. Great chocolate fondue. Open late. Expensive. Honjin Sushi. 138 Davie. Near water. Sit at bar. Monk McQueens Resto & Patio. 601 Stamps Landing, (604) 877-1351. False Creek waterfront view. Famous for oysters. Best False Creek patio. JJ Bean. 402 Davie at Howe. Best coffee and snacks. 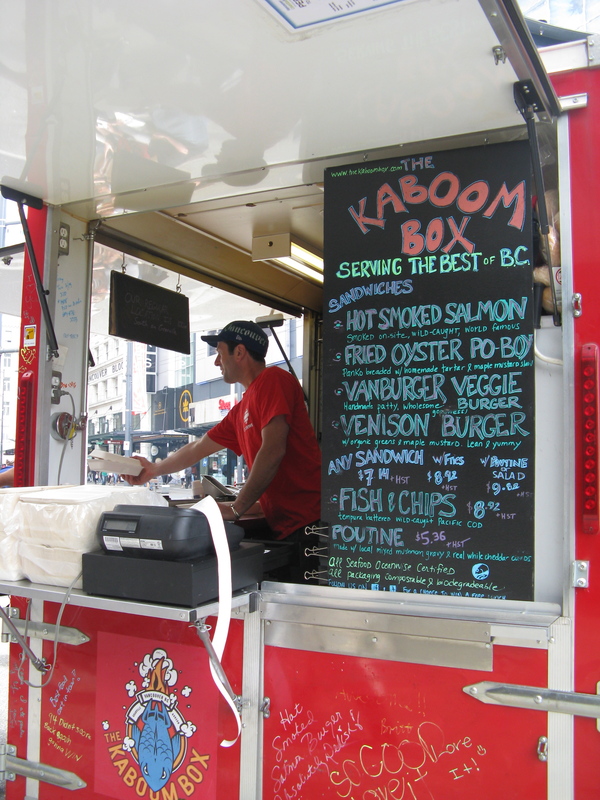 Thanks to Vancouver’s incredible street food culture, downtown is THE place to go to get great food. See HERE for all my street food recs. Favourites are Fresh Local Wild and Tacofino Cantina. La Taqueria Pinche Taco Shop. 322 West Hastings. Authentic and well-priced tacos. Also on South Cambie. Sciue. 110 800 W Pender at Howe, also at 126 Davie at Roundhouse (Yaletown). If it is pouring or all the street food carts are sold out, pop in here for a half decent snack or quick lunch (as we did often during the Olympics). Roman-style pizza, many varieties. Cafeteria-style. 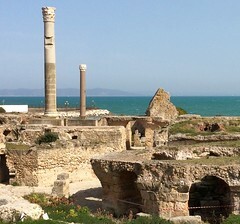 Cibo. Seymour at Smythe. Modern Italian technically, but just plain delicious. Market by Jean-Georges in the Shangri La Hotel. 50 minute $29 lunch. $65 6 course set menu. Lobby bar also good. Rec: crab dumplings in meyer lemon, sirloin, banana caramel cake. Best app: rice cracker tuna. Drinks: fresh ginger ale, ginger margarita. Apps 9-14, mains 22-28. 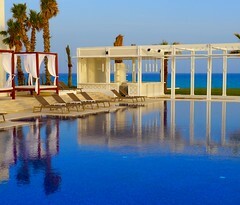 (Chi Spa also nice, and you can use the outdoor pool after your treatment). Granville Island is great for wandering, for picking up baked goods, fruit & veg, sausages, obscure ingredients, flowers, wine, and especially for eating snacks. Edible Canada is ideal for dinner, plus they have a shop selling all sorts of Canadian culinary treats. You can get here easily by taking the little pedestrian ferries from Yaletown, the West End, Kits, etc. They are cheaper if you buy tickets than if you pay cash. Look at the map though – there are two companies and their tickets are not interchangeable. Go Fish. 1505 W first Ave. W of Granville island on Fisherman’s Wharf, walk W along water. Lineups. Outdoor shack. Best fish and chips and po boy sandwiches. Scallop sandwich. Rec: fish / shellfish tacones, soup, clam sandwich, fish and chips. Closed monday. 1130 am to 630pm or sellout. 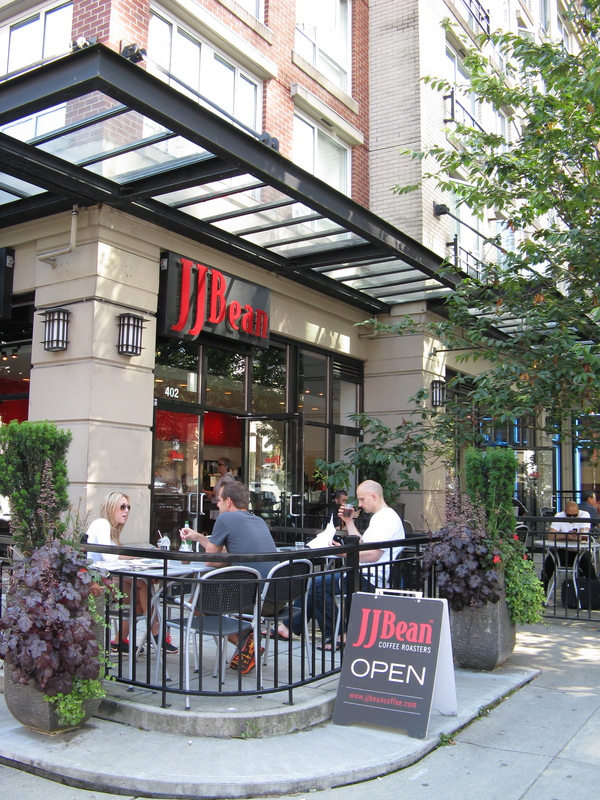 JJ Bean. Supposedly the best location. South Granville is the neighbourhood just up from Granville Island. Vij’s.1480 W 11th Ave. Indian fusion. Phenomenal. Crowded. No reservations. But you can stand in the back and wait for a table and they give you yummy nibblies. NY Times says this is easily among the finest Indian restos in the world. 5:30 on. Vij’s Rangoli. 1488 W 11th Ave. Frozen and ready-to-heat stuff from Vij’s, lunch and dinner. Tsai Hang. 1193 Granville. Yang chow fried rice (open late). West. 2881 South Granville. Local food in an elegant setting. If there is crab on the menu, order it. Part of the Top Table Group. 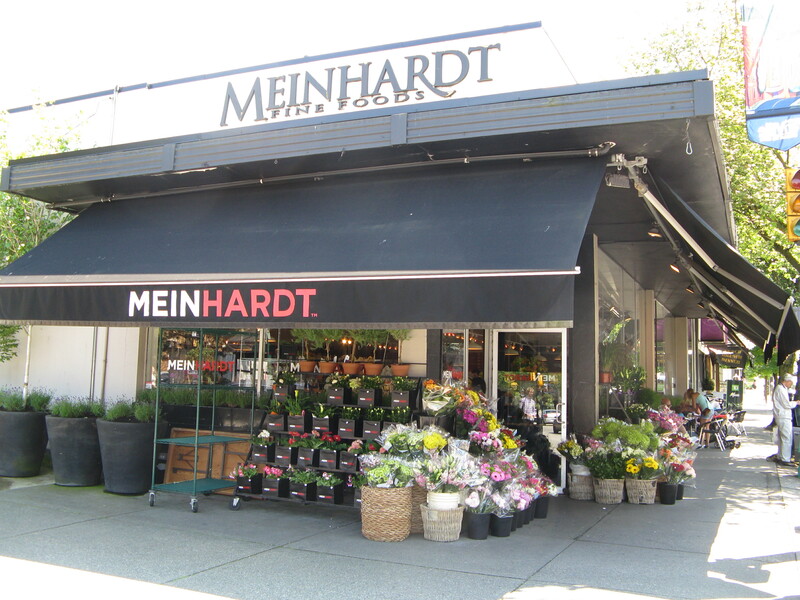 Meinhardt’s. 3002 and 3010 South Granville. Foodie grocery store with good snack counter. Tojo’s. 1133 W. Broadway, E of Granville before Oak (Cambie Village). 604-872-8050. Best sushi in Vancouver. Very expensive. Kits is a great neighbourhood to wander in. Nice shopping, gorgeous houses and gardens to gaze at. Has a granola yuppie feel. 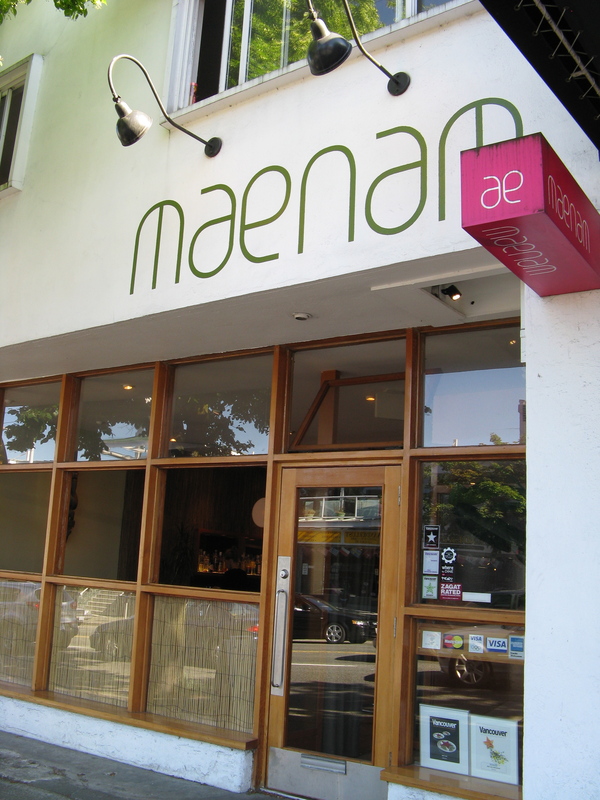 Maenam. 1938 W 4th 604-730-5579. Creative Thai thanks to wonderful chef Angus An. A must try. Supposedly compares to Michelin-starred Nahm in London. Burrito Brothers. Baja style fish tacos. Arbutus Coffee. 2200 Arbutus at 6th Ave (in the grocery store). Rec: panini. Refuel. 1944 W 4th. Pork and seafood, local. Casual. Burgoo Bistro. 4434 West 10th Ave. Comfort food from around the world, at reasonable prices. Rec: gooey cheese grillers, soups, hot choc chili pot. Other locations. 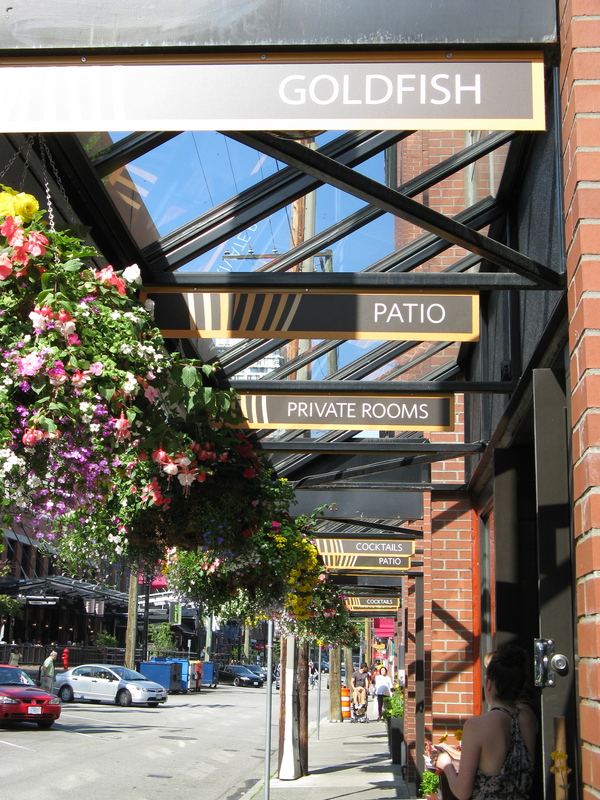 Gastown has a feel of both the tourist junk shops and the back alleys of Times Square. Lots of great restaurants in and around here. Salt Tasting Room. 45 Blood Alley. How can you resist this name, or the address? Sample charcuterie, cheese, wines by the glass. Awesome. Alibi Room. 157 Alexander St. Especially noted for their beer. Boneta. 1 W Cordova. Modern bistro. Brioche. Cafe & bakery. 401 W Cordova. Pasta at night too. Kitanoya Guu with Otoko Mae (several locations) 105-375 Water St (upstairs). Japanese fusion. More casual and not quite as delicious as Kingyo in the West End. But still good. The Pie Shoppe. 721 Gore St. Opens at 11 am, closes when the last slice is sold. Harvest Community Foods. 243 Union St. Grocery and noodle (ramen and udon) shop. Featuring Earnest ice cream, Gourmand macarons, Beta 5 chocolates, and It’s To Die For banana bread. The raman is westernized but labelled very good by ramen experts (and pork heavy). Mijune Pak recommends the rice noodle with hazelnut and charred chili (soupless ramen). The Union. 219 Union at Main. Pan-Asian casual. Good cocktails. Bao Bei. 163 Keefer. Upscale Chinese brasserie. 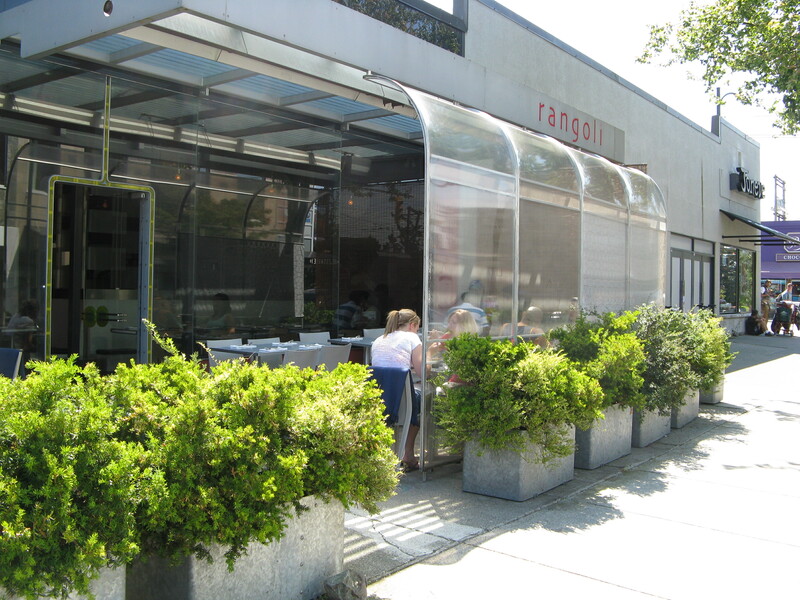 Won 2010;s best new resto award. Phnom Penh. 244 East Georgia St. Authentic Vietnamese and Cambodian. Try the deep-fried squid or the prawns with lemon pepper sauce. Au Petit Chavignol. Next door to Les Amis. Wine and cheese bar. Casa Gelato. 1033 Venanles St. The Wilder Snail. 799 Keefer. Grocery and cafe. Dunlevy SnackBar. 433 Dunlevy Ave at East Hastings. Asian flavours in small plates meant for sharing, e.g. Japanese inari-zushi, pork belly steamed buns, a daily Korean bibimbap. Habit Lounge. 2610 Main. Small plates for sharing. Locas Cafe. 4121 Main. Hefty portions. Burgoo Bistro. 3096 Main. Comfort food from around the world, at reasonable prices. Rec: gooey cheese grillers, soups, hot choc chili pot. Other locations. Campagnolo. 1020 Main. No reservations. Same owners as Fuel, simpler. Chef Robert Belcham voted Van top chef. Heritage pork. Charcuterie. Rec: tagliarini, ling cod, Crispy Ceci app. Bob Likes Thai Food. 3755 Main. “No-frills spot serving vibrant traditional Thai fare”. (anther rec by Carolyn). Really great Thai with bright flavours. Lovely for visiting, even better for living. But I only cross over to visit friends, so I don’t have many recs…. Burgoo. 3 Lonsdale Ave (North Van). Comfort food from around the world, at reasonable prices. Rec: gooey cheese grillers, soups, hot choc chili pot. Other locations. You’ve got lots of great Vancouver restaurant recommendations here! One update: Aurora Bistro (Main Street) has closed. A couple of other spots that you might try in the South Main area are Cafeteria (2702 Main St., http://www.cafeteriavancouver.ca), a small contemporary dining room — no, not a cafeteria — from the owners of Pied-a-Terre, and Bob Likes Thai Food (3755 Main St., http://www.boblikesthaifood.com), a no-frills spot serving vibrant traditional Thai fare. Awesome – really appreciate the updates, I’ll add ’em in. Will try your suggestions when I’m out there again at the end of June. Thanks Carolyn! Thanks for the rec! I’ve added it to the field notes. Happy to have more! La Quercia in the west 4th area (near to the University) is unparalleled north Italian. Small restaurant and reservations are a must but the chef owner will wow you with his ever changing menu, fresh in house made pasta and sauces and meats that have a touch of genius. La Quercia was delicious! And the lemon dessert …. drooling now!